This year’s Association of Air Ambulances (AAA) National Conference took place once again at the Millennium Gloucester Hotel in Kensington, London. In a departure from last year, the organisers removed one theatre to deliver a more interactive workshop programme. Featuring 23 speakers, the one-day conference looked at the future developments of air ambulance fundraising, operation and clinical activity. Following a brief welcome from AAA national director, Clive Dickin, Hannah Sebright, AAA vice chair, gave delegates an outline of the AAA’s key issues. These included the AAA supporting the call for the European VAT Directive to be amended so all European charities are able to reclaim VAT charges from carrying out their approved activities, and support for local air ambulances and ambulance services through the provision of both financial and clinical help at a local level. Prof Keith Willett, director for acute episodes of care, NHS England, then gave an update on the Urgent and Emergency Care Review. Explaining developments, findings and the likely impact on pre-hospital aeromedical care, he commended the collaborative work of AAA and the various air ambulance charities. He concluded by highlighting the need for more evidence-based research in helicopter emergency medical services (HEMS). Mike Shanahan, head of special operations, Yorkshire Ambulance Service NHS Trust (YAS), then provided a review of the preparation and deployment undertaken by YAS for the Grand Départ of the Tour de France. After the first coffee and networking break of the day, Steve Wheaton, assistant chief ambulance officer, West Midlands Ambulance Service NHS Foundation Trust, gave a report on the Joint Emergency Services Interoperability Programme (JESIP), outlining progress so far and lessons learned from the Exercise Joint Endeavour held in September. This was followed by an update on the European Aviation Safety Agency by Brian Baldwin, helicopter flight operations, Civil Aviation Authority. Nicola Stewart ended the pre-lunch talks with a Care Quality Commission update on changes to regulation of care. Throughout the day there were a number of breakout sessions and workshops, offering delegates the opportunity to discuss key topics and areas of interest. Some of the highlights of these sessions include Dr Paddy Morgan, anaesthetist/intensivist, Great Western Air Ambulance giving a review of the drowning process, and Alistair Wood, GE Medical systems looking at portable ultrasound in the pre-hospital care environment. After lunch, communications trainer Mark Hogan, who required air ambulance care following a fall, gave an alternative yet engaging talk on how he took on a bet to put on a comedy show at the Edinburgh Fringe Festival. Lt Col Chris Wright, defence consultant advisor, then spoke on lessons from the theatre of war. A clinician who has spent years treating injured soldiers and civilians, he outlined how lessons learnt in the field can be applied in a civilian setting. Nigel Hare, operations director, Devon Air Ambulance Trust, gave an overview of European Standards, explaining what they are and issues relevant to them. He explained how he identified a potential problem in EN 13718, the European minimum standard for safety and a specific one for air ambulances, as none of the UK air ambulances services met the standard. Dr Ben Singer of Royal Brompton Hospital then gave a talk on potential pre-hospital applications of extracorporeal membrane oxygenation (ECMO). He provided an outline of a possible model for pre-hospital ECMO, as well as circumstances where it may be used in the future. Finally, Dr Gareth Davies, consultant London’s Air Ambulance, spoke on resuscitative endovascular balloon occlusion of the aorta (REBOA) in the pre-hospital environment. This year saw the Association of Air Ambulances’ second Awards of Excellence. Held in the evening following the conference, the awards were open to all air ambulance operations within the UK and nominations were made from patients, staff, management and the general public. BBC television presenter Louise Minchin returned to host the awards, with actor and comedian Robert Llewellyn also on hand to provide support and comic relief. Nigel Hare, operations director, Devon Air Ambulance Trust, picked up two awards for the evening, including Charity Staff Member of the Year and the AAA Chairman’s Award. He was recognised for his input, commitment and passion in his work not only at Devon Air Ambulance Trust but nationally, including as a director of the Association of Air Ambulances. The Lifetime Achievement Award went to Gerry Hermer, aviation adviser to the East Anglian Air Ambulance (EAAA). Hermer was recognised for a great number of achievements, including his commitment to continue to develop and improve the aviation capacity of EAAA, despite his supposed retirement. Air Ambulance Paramedic of the Year went to Mark Fuszard of Cornwall Air Ambulance Trust, Air Ambulance Doctor of the Year went to Dr Rik Thomas of Essex and Herts Air Ambulance Trust, and Air Ambulance Pilot of the Year went to Captain Paul Smith of Lincolnshire and Nottinghamshire Air Ambulance Trust. Other winners were Jayden ‘JJ’ Butcher for the Outstanding Young Person Award; Janice Flower, who was named Charity Staff Member of the Year; and Gladys Tingle, who was named Charity Volunteer of the Year. The Air Ambulance Campaign of the Year went to London’s Air Ambulance for their ‘25th Anniversary Campaign’, and the Special Incident Award went to Midland’s Air Ambulance Charity. Taken from Journal of Paramedic Practice, published 5 December 2014. Last month, air ambulance charities across the country appealed to the public to celebrate the work of local air ambulances and promote awareness of the services they provide. Running from 22–28 September, National Air Ambulance Week is a national campaign introduced by the Association of Air Ambulances, which gives the air ambulance community a national voice and an opportunity to promote the work that they do at a local level (Association of Air Ambulances, 2014). Last year’s campaign saw notable exposure as a result of a celebrity video montage which featured 17 celebrities and sports personalities saying the words: ‘I support my local air ambulance, do you?’ As part of the initiative for 2014, local charites have turned to the general public and asked them to produce a short video quoting the same words and place it on their social media feed. To increase the number of participants in the campaign, those producing videos were asked to use the tag #NAAW2014 and to nominate three individuals to also upload a video. Hanna Sebright, chief executive for Midlands Air Ambulance Charity, said: ‘National Air Ambulance Week has now become a regular feature on people’s calendars and there are so many different ways that people can get involved. The creation of a video and donating via text is one of the easiest ways to demonstrate your support of our vital life-saving charity, so we are looking forward to seeing how the public respond’ (Midlands Air Ambulance, 2014). ‘We really want people to have fun with this, a ‘selfie video’ is probably one of the easiest ways of getting involved and we look forward to seeing what crazy yellow-themed activities people are prepared to do (Essex Air Ambulance, 2014). Further support has come from celebrities, with videos from UB40 frontman Ali Campbell, Men Behaving Badly actor Martin Clunes, and Only Fools and Horses actor John Challis, appearing online. Air ambulance charities in the UK generate £96.7 million a year, operate 36 helicopters, and have a volunteer network of over 2 500 people. With many charities investing funds to expand their operations to provide night Helicopter Emergency Medical Services (HEMS) missions or placing investment into the advanced education and training of their paramedics and doctors, the need for continued support for air ambulances has never been greater. Taken from Journal of Paramedic Practice, published 3 October 2014. A report produced by the Association of Air Ambulances (AAA) has highlighted that 60% of air ambulance landing facilities are inadequate in the UK, raising concerns that this could lead to greater morbidity and mortality. The report, which was produced by the AAA after the issue was raised at the All Party Parliamentary Group for Air Ambulances (APPGAA) Annual General Meeting in October 2013, focuses on the treatment of major trauma—the biggest killer of people under 50 years of age. On average, 70 people are treated by air ambulances in any one day. Patients attended will often be critically ill, suffering from major trauma, burns, cardiac or neurological illness. However, despite the severity of the conditions presented, air ambulances frequently have to land some distances from the hospital in inadequate facilities, which require a land ambulance to complete the journey to definitive care. The report reviewed the 29 Major Trauma Hospitals for adults and children in the UK and concluded that only seven have suitable helipads. A further eight have landing facilities with operational issues and the remaining 15 sites require a secondary land transfer by land ambulance or vehicle. The effect this has on the delivery of care to patients is clear: while the care itself isn’t generally affected, it is the delays to the provision of that care that can be potentially life-threatening for the patient. Many hospitals have taken a ‘one size fits all’ route so they look for a very large landing facility that can accommodate larger aircraft. However, if you look at the number of actual missions that air ambulances carry out each year (just over 20 000, in comparison to approximately 1 000 for search and rescue), the facilities that are needed are for small helicopters, not large. The factors that dictate the location of helipads is also something that has to be taken into consideration. ‘There is always restrictions on sites,’ says Dickin. Some hospitals have found innovative ways in which to combat this problem. For example, Southampton General Hospital has built a raised platform above a car park. Helipads built more than 3 metres from the ground require the presence of fire marshals when helicopters are taking off and landing, which involves an additional revenue cost. However, by building a helipad approximately 2.4 metres above ground, Southampton General Hospital has been able to eliminate this unnecessary cost. A number of hospitals have built helipads only to have restrictions on their operation, resulting in them not being fully manned 24/7. This obviously presents a problem when you have a patient who is treated by a night HEMS aircraft. Both the APPGAA and the AAA are calling on the Government to endorse a policy of recognition of parity for all patients arrival facilities. The report argues that it is unacceptable and not in keeping with the principle of ‘Equality of Care’ for patients to have reduced access to definitive care, in comparison to a patient arriving on a land ambulance. This is heightened by the fact that air ambulance patients are typically in need of time-critical care. Just over 50% of patients treated by air ambulances go to MTCs each year, so although it is important to focus on land ambulances, it is equally important to put in as much focus on helipads. Although there are well-developed plans for landing facilities at a number of UK hospitals, including: Bristol Royal Infirmary/Bristol Children’s Hospital/Bristol Southmead; Derriford Hospital, Plymouth; Hull Royal Infirmary; and St George’s Hospital, London, it is clear that improvements are still needed within other areas of the country if appropriate care is to be given. Taken from Journal of Paramedic Practice, published 2 May 2014. The Association of Air Ambulances (AAA) has issued two new clinical guidance standard operating procedures (SOPs). The new SOPs, titled ‘Hypothermia in Major Trauma’ and ‘Management of Pre-Hospital Asthma’ were published by the AAA’s Clinical sub-committee in January, and will join the already extensive list of guidelines. He added that 2014 will see the AAA issue a further seven guidance SOPs, while maintaining and improving those currently in use. 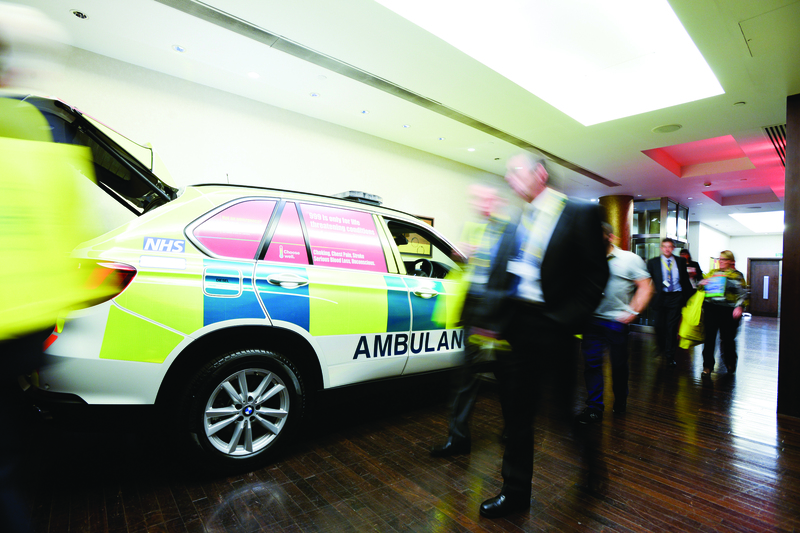 This year’s Air Ambulance National Conference, organised by the Association of Air Ambulances (AAA), took place at the Millennium Gloucester Hotel in Kensington, London. Offering a fantastic opportunity for those involved in this exciting field to engage with a number of key issues, the one-day conference saw 27 speakers spread over the three colleges of charity, clinical and operational. Following a welcome from AAA National Director, Clive Dickin, the conference commenced with an air ambulances update from AAA Chairman, Bill Sivewright. He highlighted a number of successes of the year, including improved representation of the air ambulance sector as a result of the formation of the All-Party Parliamentary Group for Air Ambulances, noting how it has allowed air ambulances to engage with MPs directly. Prof Sir Keith Porter, Clinical Service Lead for Trauma Services at Queen Elizabeth Hospital Birmingham, then delivered a talk on advances in haemorrhage control and the use of blood products. Outlining a number of important lessons that have been learnt from dealing with military casualties, he explained how damage control surgery can be used to improve a patient’s chance of survival. After a quick coffee break, Dr David Rowney, Chair of the UK Paediatric and Perinatal Transport Group, spoke on the future of paediatric air transport. He explained the current lack of a national aeromedical transport service for babies and children and highlighted some of the challenges being faced. This was followed by a joint presentation on night HEMS, where members of various air ambulance charities and operators spoke on some of the hurdles that were faced in the introduction of night HEMS operations. Anthony Marsh, Chairman of the Association of Ambulance Chief Executives, talked on interoperability between ambulance services and air ambulances. Alluding to Sir Bruce Keogh’s recent review into urgent and emergency care, he emphasised that ambulance services have a real opportunity to create the step-change needed in the National Health Service and that we should be ambitious in our expectations of paramedics. Martin Edwards, Chief Executive Officer of children’s hospice Julia’s House Dorset, ended the pre-lunch talks with an engaging presentation on how charities communicate, providing advice on how to stand out from the crowd. Throughout the day there were a number of breakout sessions, offering delegates the opportunity to discuss key topics and areas of interest. Some of the highlights of these sessions include Dr Anne Weaver, Lead Clinician for London’s Air Ambulance, who led the ‘Blood on Board’ initiative, speaking on the pros and cons of carrying blood; Dr Gareth Grier, consultant in emergency medicine and pre-hospital care, the Royal London Hospital, speaking on cardiopulmonary resuscitation devices; and an open mic that allowed delegates to ask questions about the night HEMS operations. After lunch, Nick Simkins, Partner—Chantrey Vellacott DFK, spoke on developments and areas of change in the charity sector in reporting on finance and fraud. According to the National Fraud Authority Report 2012, 10% of charities reported a fraud in 2012. Providing suggestions for best practice, the talk was both informative and interesting. 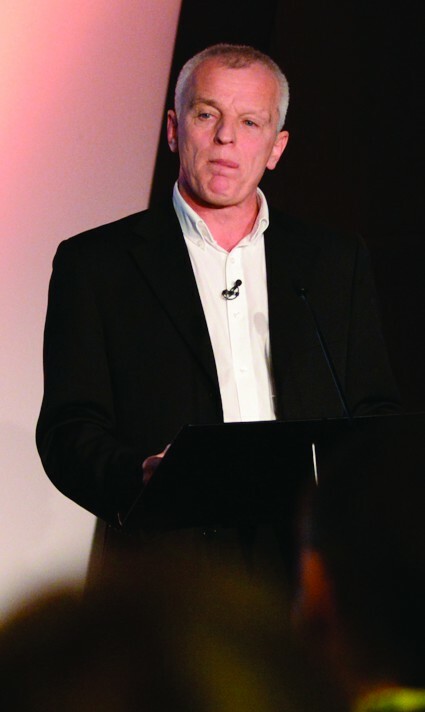 This was followed by Alistair Maclean, CEO of the Fundraising Standards Board, who explained how the charity sector is regulated, before outlining popular air ambulance fundraising techniques. Ollie Dismore, Flight Operations Director of the National Police Air Service, provided an update on the service, outlining future steps such as the rationalisation of aircraft processes and national contracting where appropriate. Anni Ridsdill Smith, Director of Airate Ltd gave a talk on the importance of non-technical skills to the effective working of safety, security and time-critical teams. Comprising of cognitive skills, social skills and personal resources, Ridsdill Smith stressed that as much time should be given to the development of non-technical skills as technical skills. Finally, Guy Opperman MP, Chairman of the All-Party Parliamentary Group for Air Ambulances, closed the conference with a brief explanation of the role of the Group. He said that its aim was to provide support and assistance in charity fundraising and to help iron out problems and issues of bureaucracy. Before the conference was closed, Clive Dickin thanked all the delegates for coming and announced the publication of the Framework of a High Performing Air Ambulance Service 2013. 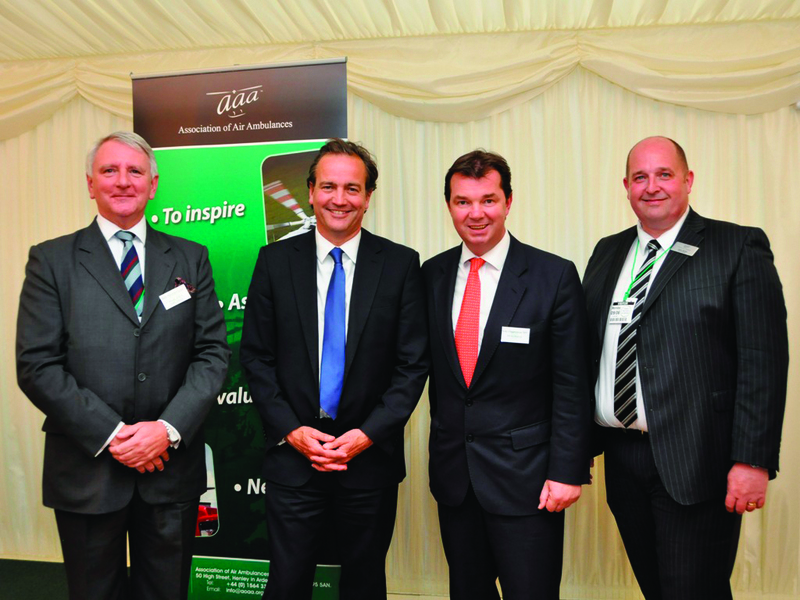 This year also saw the Association of Air Ambulances’ inaugural Awards of Excellence. Held in the evening following the conference, the Awards were open to all air ambulance operations within the UK and nominations were made from patients, staff, management and the general public. BBC television presenter Louise Minchin hosted the awards, her bubbly demeanour and genuine admiration for the nominees being well received by all. She was aided by noted GP and comedian Dr Phil Hammond, who added a number of comic interjections and moments of light relief. Of the awards themselves, four were won by members of the London Air Ambulance (LAA), including: Gareth Davies as Air Ambulance Paramedic of the Year, Dr Anne Weaver as Air Ambulance Doctor of the Year, and Captain Neil Jeffers as Air Ambulance Pilot of the Year. The Lifetime Achievement Award went to LAA’s Dr Gareth Davies, who was recognised for his role in pioneering the ‘doctor on board’ model for air ambulances, taking life-saving surgery and advanced pain relief from the hospital to the roadside. Other winners were Poppy Young, for the Outstanding Young Person Award; Janice Flower, who was named Charity Staff Member of the Year; and Jenny Ashman, who was named Charity Volunteer of the Year. The Air Ambulance Campaign of the Year went to Devon Air Ambulance for their ‘Devon Ambulance on Tour’, and the Special Incident Award went to Dorset and Somerset Air Ambulance. The AAA Chairman’s Award was presented to Clive Dickin, for the great work he has done for the air ambulance community since taking up the position of National Director of AAA. Following the awards ceremony, Dr Hammond performed a stand-up routine consisting of excerpts from his current tour. Recounting numerous mishaps he had as a junior doctor, the health commentator couldn’t have had a better audience, as guests were equally shocked and amused at his younger self’s clinical judgement, providing an excellent end to the day’s events. Taken from Journal of Paramedic Practice, published 4 December 2013. London’s Air Ambulance (LAA) has received notable recognition at the Association of Air Ambulances’ inaugural Air Ambulance Awards of Excellence, held on 18 November 2013 at the Millennium Gloucester Hotel in Kensington, London. Hosted by BBC television presenter Louise Minchin and GP/comedian Dr Phil Hammond, four of the independently judged awards were presented to LAA, including Air Ambulance Paramedic of the Year, Air Ambulance Doctor of the Year and Air Ambulance Pilot of the Year. The Awards are open to all air ambulance operations within the UK and nominations were made from patients, staff, management and the general public. The 2014 awards ceremony will take place on 17 November, with nominations being taken via the AAA website from 1 January until 1 September. Taken from Journal of Paramedic Practice, published 26 November 2013.